Hailstorm was reported in areas like Subhash Nagar and Paschim Vihar in the morning in the national capital, which received rains throughout Monday night. 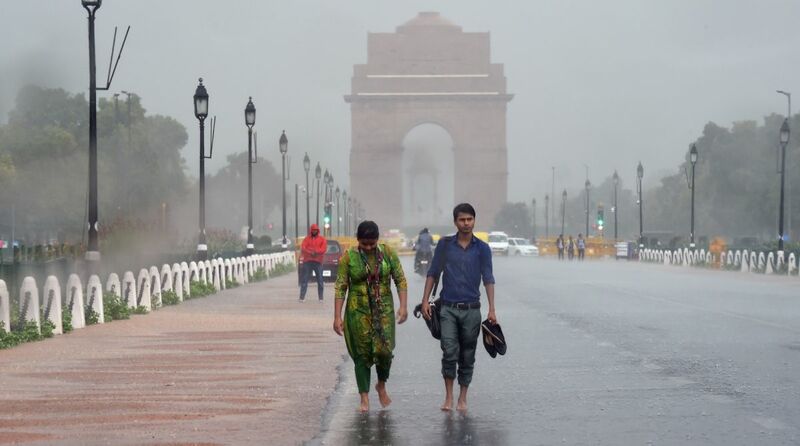 Heavy rains and hailstorm lashed parts of Delhi on Tuesday morning bringing the air quality down to “moderate”. Heavy rainfall and hailstorm also lashed Haryana’s Gurgaon early on Tuesday. Widespread rainfall was experienced in most parts of Punjab and Haryana on Tuesday. Temperatures are likely to fall further due to snowfall in neighbouring Himachal Pradesh, the Met said. The weather office has predicted rains and thundershowers with gusty winds for Punjab and Haryana, Chandigarh and Delhi this week. Meerut District Magistrate has declared a holiday for students of classes one to eight in all government and private schools for Tuesday in view of the cold weather conditions. At least 15 trains to Delhi have been delayed due to foggy weather conditions and low visibility. Heavy rains have led to traffic congestion in various parts of the city. As per the IMD, this sudden change in the weather is owing to two western disturbances over the northern hills and its induced cyclonic circulation over the northwestern plains which is expected to remain till the end of the week. In terms of pollution, the authorities have forecast an improvement in Delhi’s air quality from “very poor” to “poor” by Wednesday. The overall Air Quality Index (AQI) of Delhi at 4 pm on Monday stood at 346 (very poor), against Sunday’s “severe” air quality at 404. “A significant improvement is expected further as there is an appreciable increase in the wind speed to 4.6 kmph from Sunday’s 2.8 kmph. Due to the predicted rainfall, air quality is likely to improve to ‘poor’ levels by Wednesday,” System of Air Quality and Weather Forecasting and Research said in its daily pollution analysis on Monday.